During the festive period I have been rather short staffed, which is always detrimental to my ability to type freely. It is difficult to explain the frustration of a writer who cannot actually write due to his deteriorating body and poor dexterity. Subsequently, I have decided to set up this blog post which I will write in times of despair and creativity. It will be totally unstructured, contain random words relating to my mood, YouTube links, Tweets and ideas for future projects that I would like to work on after I have saved the Welsh Independent Living Grant. This period will be updated at random intervals as we head towards 2019. Please note that there will almost certainly be lots of foul language used in this post as we focus on the frustration over life in a 21st Century Britain for a disabled person. On 30th May 2019 I have tickets to see John Cooper Clarke at Venue Cymru, Llandudno as part of his The Luckiest Guy Alive Tour. His book, of the same name, was published in November 2018 and I have just downloaded a copy to my Kindle. Following my poetic publications during 2017, it would be great to have the opportunity to meet this Poet; Movie Star: Rock Star; TV & Radio Presenter; Comedian; Social & Cultural Commentator. I have just lost one hero, in the form of Pete Shelley, so it would be fitting to meet another. I will look into ways of contacting JCC in the hope that he might offer me some tips advice and inspiration for my future poetic projects. Here is the blurb for The Luckiest Guy Alive, which is available on Amazon or other outlets who actually pay their taxes. The Luckiest Guy Alive is the first new book of poetry from Dr John Cooper Clarke for several decades – and a brilliant, scabrous, hilarious collection from one of our most beloved and influential writers and performers. From the ‘Attack of the Fifty Foot Woman’ to a hymn to the seductive properties of the pie – by way of hand-grenade haikus, machine-gun ballads and a meditation on the loss of Bono’s leather pants – The Luckiest Guy Alive collects stunning set pieces, tried-and-tested audience favourites and brand new poems to show Cooper Clarke still effortlessly at the top of his game. Cooper Clarke’s status as the ‘Emperor of Punk Poetry’ is certainly confirmed here, but so is his reputation as a brilliant versifier, a poet of vicious wit and a razor-sharp social satirist. Effortlessly immediate and contemporary, full of hard-won wisdom and expert blindsidings, it’s easy to see why the good Doctor has continued to inspire several new generations of performers from Alex Turner to Plan B: The Luckiest Guy Alive shows one of the most compelling poets of the age on truly exceptional form. OBJECTIVE: Contact John Cooper Clarke through his agent and try to arrange to meet him in Llandudno. It is hard to look forward to anything while I am still in the middle of my reassessment by WCBC for Independent Living. A Panel of Council representatives will apparently decide how many hours of support I deserve per week. I am prepared for negative news as I am sure the hours I am offered will not match the hours I require to fulfil my ambitions and subsequently protect my mental well-being. It is annoying to be left in a state of indecision over the festive period. I am unable to make any long-term plans aside from my determination to take this decision over my future out of the hands of cash strapped local authorities and make sure that the Welsh Independent Living Grant is reinstated. There are already some key dates in my diary for 2019 and believe you me, the fight to #SaveWILG is far from over. Fantastic display this afternoon by @Wrexham_AFC. full credit to the team. It is such a pity that all my enthusiasm and sense of belonging has been stolen by those who refuse to listen to the resolution that we passed. I am really wanting to finish my book on Wrexham AFC. I plan on restarting my Memory Match column in the New Year. All proceeds from the volume will go to the Wrexham DSA. It will be easier to get things such as this done once I have completed the reassessment programme that Wrexham Council started but failed to finish before this annoying period between Xmas and New Year when no one is working and everyone pretends that family is the most important thing in the world. It is like being trapped in an Eastenders Omnibus. I wish I could get a good nights sleep. It is impossible to do this when I am sleeping alone in my bungalow and I wake up at least twice a night to struggle with one of a number of things. Whether it is trying to grab hold of my urinal, straighten my fingers out of the clenched fist that they naturally curl into or attempting to straighten my leg after it bends at the knee and my foot ends up in my groin. The simple solution to these problems would be to have a PA available overnight. This is not really what I want, but it is what I NEED. I haven’t had a proper nights sleep for many years and it definitely affects my mental health and well-being. I should be wearing hand-splints at night as well as using a T-bar underneath my knees to keep my legs straight. I can’t do either of these things without the support I need. Whether or not Wrexham Council help me to find an agreeable solution to these problems remains to be seen, but I am not holding my breath and continuing my efforts to #SaveWILG. OK, so I’m tired of sleeping in a half-empty bed, but a conventional relationship is the last thing I want. At £80 for a six-month subscription, is it really worth the hassle? Maybe it just wasn’t meant to be this time around? Do I really need an outside distraction with the #SaveWILG Campaign is at a crucial juncture? Maybe I should be careful what I wish for after getting my hands burnt in the past? According to Wikipedia, Mysinglefriend.com is a UK online dating site which claimed, in July 2013, to have over 200,000 users. One of the original founders is Sarah Beeny, a TV presenter on Channel 4. The site describes itself as having “a no-nonsense approach to dating”, as all of the dating profiles on the site are written by friends of single people, instead of the single person themselves. The single person can approve what has been written before it goes live, and their friend can also get involved by recommending other users on MySingleFriend to them. The site aims to match make singles through their friend’s descriptions of them, building an online community and taking away the hassle and stigma of writing your own dating profile. It was with great sadness that we learnt of the passing of former Wrexham striker Mickey Metcalf, who spent almost six years at the Racecourse with a remarkable goalscoring average of a goal every other game, having scored 73 goals in 145 league and cup appearances for the then ‘Robins’. Liverpool born (24 May 1939), upon leaving school Mickey joined Everton as a junior, and it was following Wrexham manager Cliff Lloyd’s visit to watch the Everton Youth side that he enquired about the possibility of signing Mike, and to his surprise Everton agreed to release him. That was in May 1956, and Mike went on to make steady progress with the Wrexham reserve side in the competitive Cheshire County League. He was eventually given his first team opportunity in October 1957, when he made his Football League debut at home to Hartlepool United in a 3-1 win and remained in the side the following match at Bradford, which Wrexham lost 2-0. However, he then had to wait almost two years before appearing in the senior side again. His chance came in a 3-2 home defeat by Chesterfield in October 1959, and he made his mark by scoring both Wrexham goals. Mike played in the next three matches before being replaced. It was the 1960/61 season that saw Mike make the inside-left position his own, as he helped Wrexham to reach the Quarter-Finals of the newly-formed Football League Cup competition, scoring a hat-trick against First Division Blackburn Rovers on the way. His goals helped the ‘Robins’ to gain promotion in the following season, though he missed out on a Welsh Cup winners’ medal as Wrexham crashed to Bangor City in the Final. ‘A Clever ball player’, Mike’s impressive record for Wrexham averaged a goal every other game, but he was surprisingly allowed to leave the Racecourse in December 1963 to join rivals Chester. At Sealand Road, Mike went on to make over 250 appearances for the ‘Cestrians’, scoring 86 goals in League and Cup competitions, collecting another Welsh Cup runners’-up medal in 1966, whilst forming part of Chester’s ‘Famous Five’ strike force in the mid-1960s. That also included Gary Talbot, Jimmy Humes, Hugh Ryden and another former Wrexham player Elfed Morris, who all netted at least 20 goals each in the 1964/65 season, which included playing at Old Trafford in a FA Cup Third Round match that saw Chester come close to a shock in their 2-1 defeat. It was following the signing of Derek Draper, that Mike decided to leave Sealand Road having scored 68 goals in 221 league appearances. In December 1968 he joined Cheshire County League side Altrincham, where he remained until the end of the season. He then signed for Bangor City, where he spent a little under two years before being appointed player/manager of his local side, Connah’s Quay Nomads, in March 1971. However, he was on the move again at the end of the season, when he joined Welsh League side, Bethesda Athletic. Mike took up another managerial appointment in 1972, as player/manager of Cheshire County League side Witton Albion. However, by October 1972 he had joined Hawarden, which was followed by playing for a number of local sides in the Chester district until well into his fifties. After retiring from professional football Mike became a qualified chemist, later running his own highly successful laboratory supplies firm based on Deeside, where he was to live in retirement until passing away on Boxing Day aged 79. He is survived by his widow Denise and sons Ian, Barry and David. A grandfather of seven, he died following a long illness. Everyone at Wrexham Football Club would like to pass on their condolences to Mickey’s family. Sick of rising rail fares and chaotic commuting?Tired of the endless tinkering with our broken privatised railway system? It’s time for a #RailRevolution. 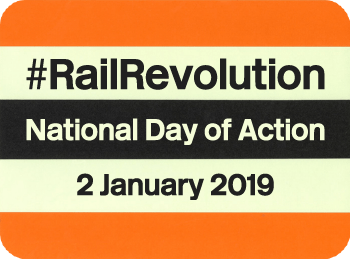 On Wednesday 2 January 2019, as our rail fares rise again by 3.1%, we’re joining forces with our friends at We Own It, the Association of British Commutersand NOR4NOR to organise the Rail Revolution: National Day of Action calling for radical reform. Coinciding with the public consultation for the government’s new ‘root and branch’ review of our railways: the Williams Rail Review, we’re calling on passengers all over the country to respond in favour of a re-unified national rail network run for people not profit. On Wednesday 2 January 2019, protests will take place at stations across the country (see list below), with a central one at London King’s Cross from 7:30-9:00am. See the Facebook event page for details, print a Bring Back British Rail placard and come join us! According to Wikipedia, Tanka (短歌, “short poem”?) is a genre of classical Japanese poetry and one of the major genres of Japanese literature. Below you can read the 19th of my 2017 poems. The aim is to write as many of these poems as possible to build a comprehensive picture of life with a disability in 21st century Britain. The Undateables is a British reality documentary show that has aired on Channel 4 since 3 April 2012 and is narrated by Sally Phillips. The series follows people who have disabilities or learning difficulties on dates.